We have taken the EXP formula and applied it to the 78" Extra! Now with larger elevators, and sharper bevels to allow for insane throw angles. The use of carbon fiber in the places that matter, providing more strength without adding weight. Also the addition of a second forward spar on the wings providing more strength to handle the stesses of today's XA Extreme Aerobatics! We have taken the classic and made it better! 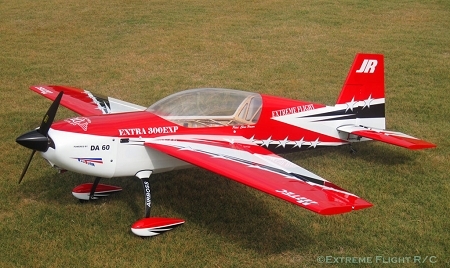 The 78 inch Extra has already proven itself capable of performing and winning at the highest levels of aerobatic competition. European Aerobatic master Donatas Pauzuolis won every round of the Aeromusical competition at the 2009 FAI sponsored World Air Games in Turin Italy with the Extra. Donatas wowed both the crowd and the judges with his daring and creative routines and the incredible performance capabilities of the 78 inch Extra allowed him to win six consecutive rounds. The Extra excels at aggressive 3D flying, intricately choreographed freestyle routines and precision aerobatic sequences. Enormous control surfaces deliver crisp, authoritative command of the Extra with instantaneous response to every stick input. Wing area and airfoil were carefully chosen to provide optimal wing loading for aggressive 3D maneuvering while still allowing for crisp and proper snap roll performance. The light weight wing panels allow for instant and accurate snap recovery and damping and make point rolls effortless. The included Side Force Generators add additional stability and increased authority in side slip (knife edge) maneuvers. 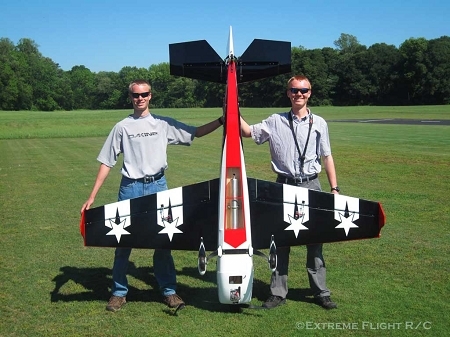 The intricate interlocking laser cut construction that Extreme Flight pioneered is prevalent throughout the Extra's structure, resulting in a lightweight yet robust airframe. Carbon fiber is used as a structural component rather than as decoration and adds to the rigidity of the airframe. Carbon wing and stab tubes are included as stock equipment along with a carbon fiber tailwheel assembly. An aluminum main gear comes standard and a carbon fiber gear will be available as an upgrade in the near future. Dubro brand ball links and titanium pushrods coupled with dual truss composite control horns provide precision control surface actuation. A canopy mounted dual spring loaded hatch latch provides positive canopy/hatch retention even during high G maneuvers. The glow/gas version features a built in pipe tunnel to allow the use of a tuned exhaust system. The 78 inch Extra is available in 2 high visibility Ultracote color schemes with contrasting bottom. The cowl and wheel pants are finished in a high gloss showroom quality finish and landing gear fairings are included to add to the scale looks of the Extra. Wingspan: 78 inches Length: 76 inches Wing Area: 1225 sq. in. Weight: 11.5 - 13 lbs.